When I go to Germany, this is a go to meal when I am tiring of all that heavy German cuisine. It is also a great way to deal with your garden veggies for which you probably have run out of ideas for use and consumption. In Germany, this is called Shaftkase mit Peperoni and Knoblach (Sheep Cheese with Peppers and Garlic). I call it delicious! First, I brought the smoker up to 350 F, no wood in the ash pan for flavoring. Then, I sliced some onion and jalapeno, then added in some pitted Kalamata and green olives, plus two whole cloves of garlic. Then, I seeded and rough diced some pickled pepperoncini and mixed everything in a bowl with some sea salt and olive oil. This mix was placed in a cast iron skillet and put on the smoker for 30 minutes. 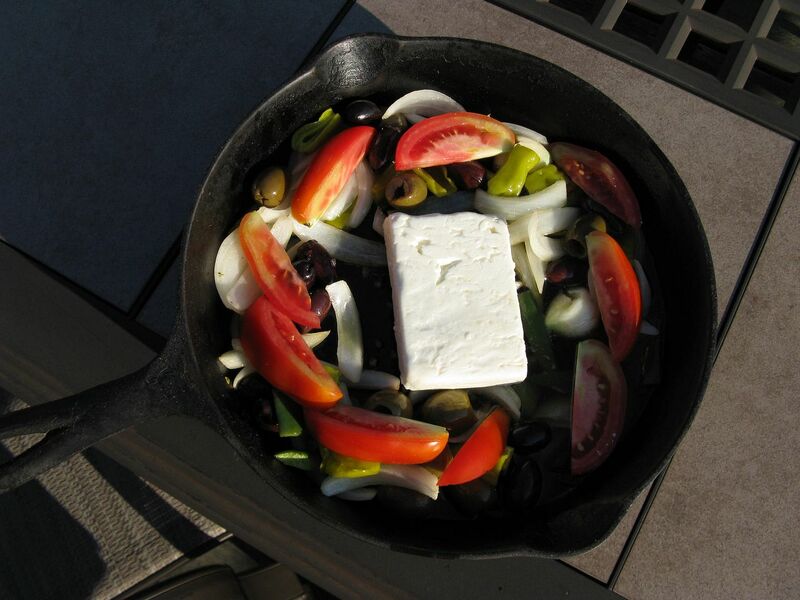 After 30 minutes, I added a slab of fresh feta cheese and Roma tomatoes, sliced into quarters. Then, I put back in the smoker for 30 more minutes and served hot with crusty Italian bread on the side. 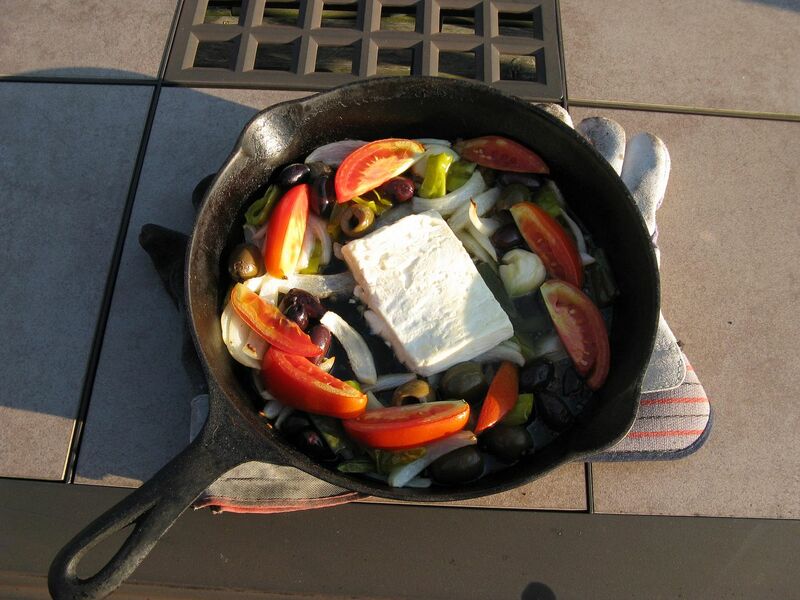 The feta does not melt, but it has a slight brown color on top and is soft enough to spread. 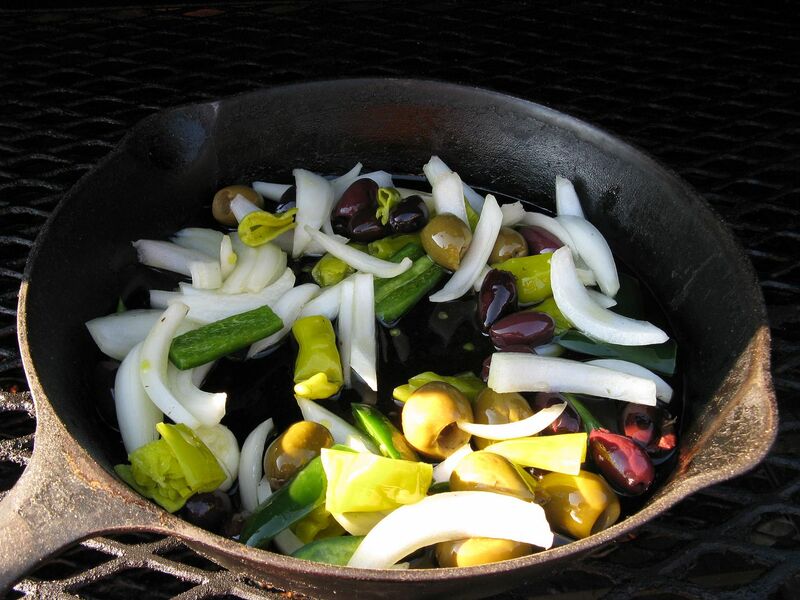 The veggies are tender crisp, the olives are lightly roasted, and so are the tomatoes. I place a little bit of everything on crusty bread and dig in. Once the good stuff is gone, make sure you have enough bread to sop up all of that garlic and pepper flavored oil. This is a nice, light summertime meal. That sounds like a great side dish. It makes a lot of sense because I usually have room on the smoker to spare. Next time you go to Germany, would you pick me up some Lowesenf mustard? I'll see what I can do for the mustard. There are so many good ones in Germany. How can I restrict you to Lowesenf?